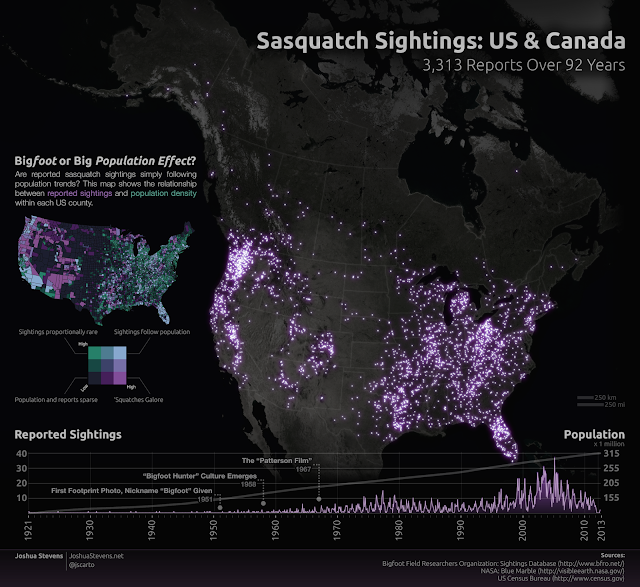 Joshua Stevens, a PhD candidate at Penn State, has just released a data map of Bigfoot sightings in North America. The data contained on the map is based off of sighting reports collected by Matt Moneymaker's group the BFRO, and covers a time span of 92 years with 3,313 individual sightings. The visual aid is a fair representation, to a certain degree at least, of what most Bigfoot researchers already know. However, it does help paint a picture to the general public. A statement I found interesting in Stevens article was that he was surprised to find that sighting reports do not always follow population density. That one would expect the majority of sightings to take place in areas with more people. Of course that is not true. Why would it be? I would expect that a rarely seen creature living in the wilderness throughout North America would most likely be seen in its own environment, not downtown Manhattan. But what this does tell us is that people are actually seeing something they at least believe to be a Sasquatch, and not just making things up. At least for the most part. Which brings us to the skeptical side of things. Logic and reasoning, the two main components of a skeptic's arsenal, tells us that the statistical probability of 3,313 reports all being 100% wrong is highly unlikely. That's a lot of dots on the map. Some of which even include multiple witnesses, and physical evidence. Another aspect is the fact that the data provided only comes from one source. There are many other websites and organizations that have their own sighting reports that aren't found on the BFRO. On top of that are the sightings that go unreported entirely. For instance, in my own home state of Oklahoma, I assure you the vast majority of sightings go unreported. I commend Mr. Stevens for his work. It's nice to see someone from outside the field taking a serious look at the phenomenon. This is the exact type of thing that needs to be taking place within the research community. This type of data is a valuable tool and asset that researchers should be creating, utilizing, and expanding upon in the future. The truth is always found in the data. By the same token.... How many mermaid reports are authentic? How large is the unicorn population? 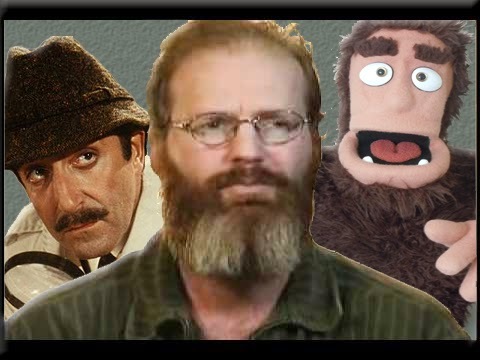 The only proven source for claimed bigfoot evidence is humans lying or hoaxing, or simply misidentifying things. That is what the phenomenon known as bigfoot has been proven to be as the source. 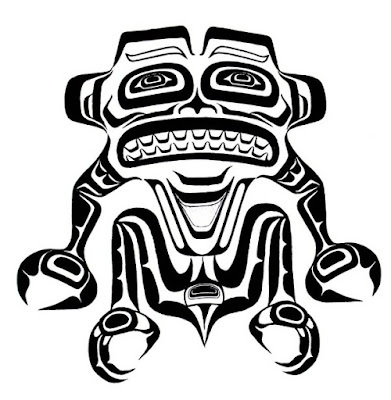 Humans and folk lore, pranking, conning.... not a big hairy ape. You are correct. The only time any bigfoot sightings have been proven to have occurred are cases in which it was either a hoax or misidentified. Thus bigfoot not being proven to exist. An easy argument to make. By your assertion, I guess you believe that the 3,000+ sightings reported on the BFRO, and the thousands of other sightings that have been reported through other sources, and the majority of sightings which go unreported, and the various historical references of the creature that have been published in one form or another, not just in the United States, but globally, are all in fact either a hoax of some kind or something being misidentified? An expert in the field of primate foot anatomy is misidentifying bear tracks left and right? All these thousands of people from all different walks of life, different social statuses, many with nothing to gain from it, are all liars or have been duped? One hundred percent of the time. That makes sense. Really grounded in logic. Oh, but you did take the time to make the comparison to mermaids and unicorns. So you tell me, how many mermaid or unicorn sighting reports come in during an average year? How many misidentified unicorn tracks have you seen? What about throughout history? How many documented sightings?